While Susan and Towny were busily preparing their post on French laundry for The Modern Trobadors (and I mean actual dirty-clothing-going-into-water-to-get-the-stains-out laundry), I chose, instead, to muse on my favorite French Laundry. 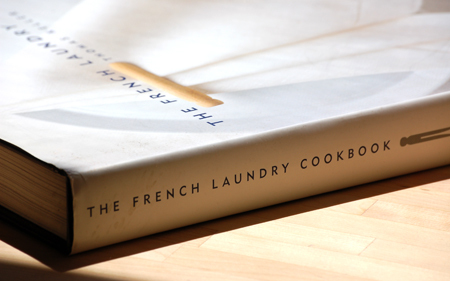 The other French Laundry. Yes, the Yountville restaurant of Thomas Keller. I have never been there. I have tried, and tried to get reservations, and friends (thank you Mikey!) have tried for me, but to no avail. It is easier to get into NORAD! Mikey was so kind as to get me the Keller's tome, The French Laundry Cookbook, but I can assure you that my cooking his recipes will be nothing like the meal I dream of one day eating at The French Laundry. In addition to the recipes from the book, I stumbled across a few others online. Once, when our friend Robert was visiting overnight, we asked what he would like for dessert after our steaks which we would grill in the fireplace over a wood fire. He snarkily responded, "Why campfire s'mores, of course! But I want YOU to make homemade graham cracker and marshmallows... And I want really good chocolate." Well, the chocolate was no problem - I always keep good Belgian chocolate on hand. But the crackers and marshmallows presented a challenge. With a little Internet surfing, I found the perfect recipe! Thomas Keller's homemade s'mores from The French Laundry. Robert was surprised and delighted that I actually did this. Reviews on Epicurious say, "Why bother? You can buy good graham crackers and the homemade marshmallows are the same as the store-bought ones." But I say to that, "Because I can! AND the taste is really incomparable." But I won't be sharing that recipe with you today. Perhaps another day when the grilling and camping seasons are upon us. For today, I have made Keller's most viewed and perhaps most beloved recipe in the world!!! 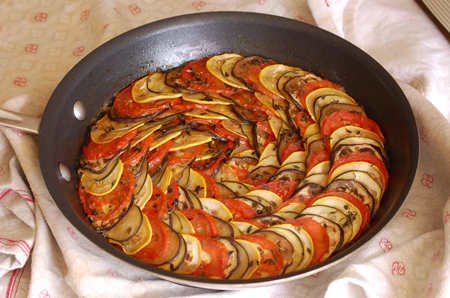 Remy's Ratatouille from the Disney film of the same name - Ratatouille! 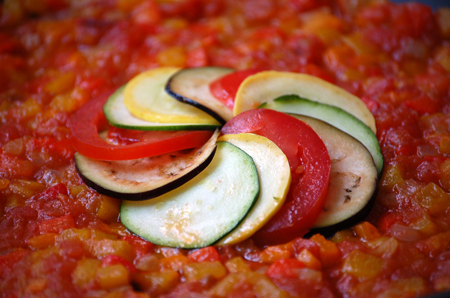 Click HERE to see a scene of Remy (a rat) making this ratatouille. 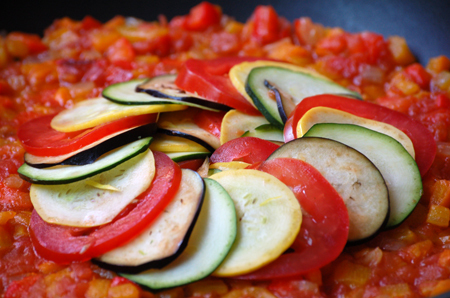 This version of ratatouille is so different from any I have had before, and I have had some good ones. But, like all Keller recipes, the presentation is truly a key ingredient to his creative success. And his version of this simple, stew-like, peasant dish is absolutely beautiful, not simple (in design), and definitely not just for peasants. When I finished prepping the dish for the oven, I found myself looking at the rose window for a cathedral whose religion is food. Such color and texture I have never seen. Yes, it is time consuming but not difficult and truly worth the effort. Don't try to plate it as they did in the movie - not as easy as it looks! (Those crafty rats made it look sooooo easy!) 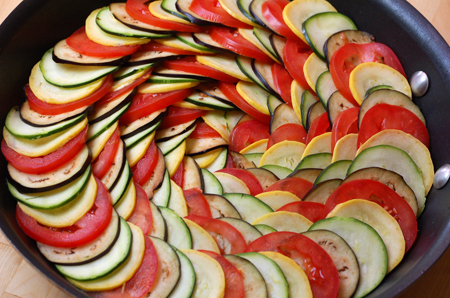 I recommend bringing the skillet to the table and letting your guests see the beauty before you hack away at it. 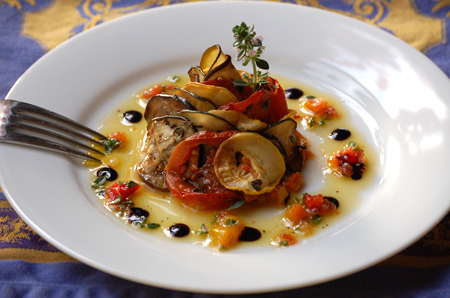 Then return to the kitchen to plate, style and decorate your plates. By itself with a salad you have a lovely vegetarian meal. 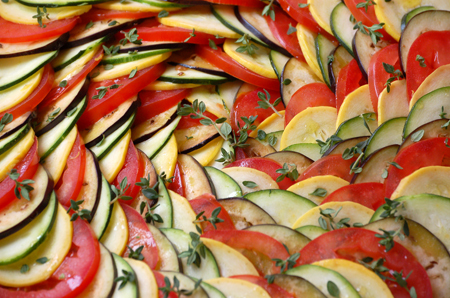 But it also makes a great side dish for Mediterranean dishes such a roast lamb or chicken. In the movie, when the evil-turned-good food critic Anton Ego said, "After reading a lot of overheated puffery about your new cook, you know what I'm craving? A little perspective. That's it. I'd like some fresh, clear, well seasoned perspective," Food critics often say that a celebrated chef doesn't deserve the praise s/he gets, but here I add my perspective: more than once I have been inspired by a chef to go outside my comfort zone when making a meal, or even a particular dish... and to plate my meals as though I was applying paint to canvas. Without the creativity of people like Thomas Keller, my kitchen would be nothing. My table would be bare. So, Mr. Keller.... NOW can I get a reservation?? Preheat oven to 450°F. Line a baking sheet with foil. 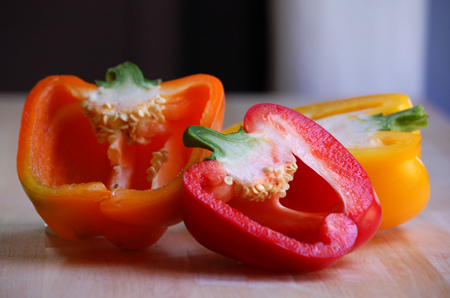 Place pepper halves on the baking sheet, cut side down. Roast until the skins loosen, about 15-20 minutes. 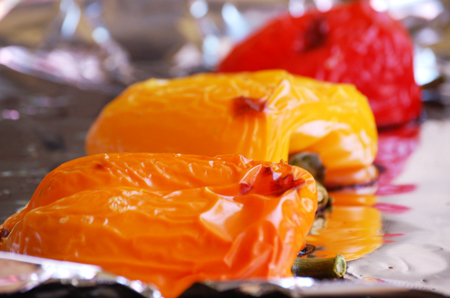 Remove the peppers from the oven and let rest until cool enough to handle. Reduce the oven temperature to 275°F. 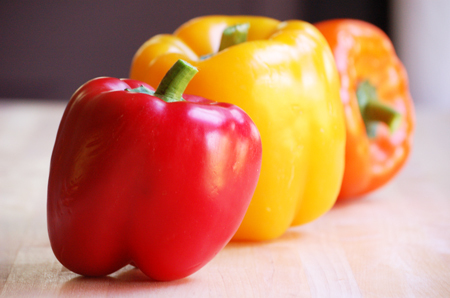 Peel the peppers and discard the skins. 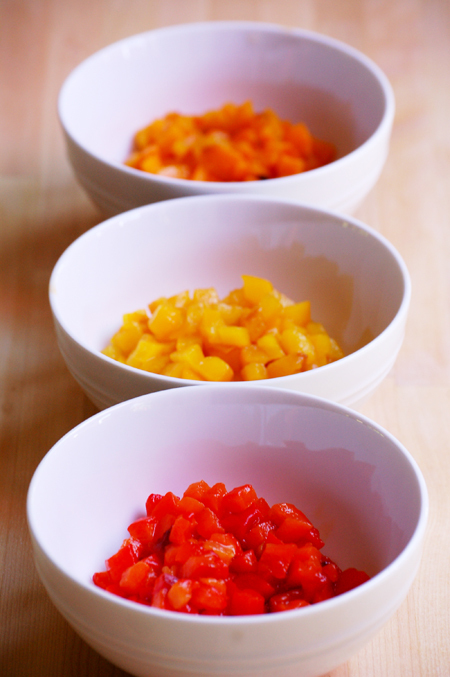 Finely chop the peppers, then set aside. In medium skillet over low heat, sauté onion in oil until very soft but not browned, about 8 minutes. 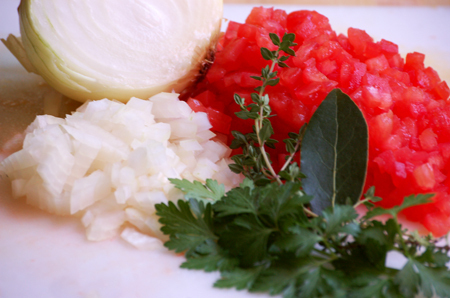 Add the tomatoes, their juices, thyme, parsley and bay leaf. Bring to a simmer over low heat and cook until very soft and little liquid remains, about 10 minutes. Do not brown. Add the peppers and simmer to soften them. Discard the herbs, then season to taste with salt. Reserve a tablespoon of the mixture, then spread the remainder over the bottom of a 10-inch oven-proof skillet (the bottom should be 8 inches). 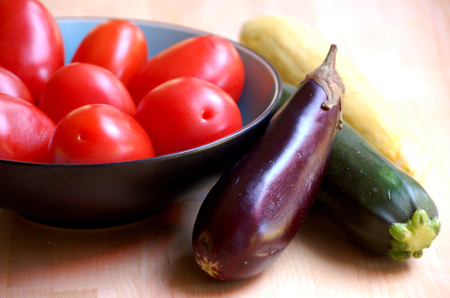 In a small bowl whisk together the reserved tablespoon bell pepper mixture, oil, vinegar, herbs, and salt and pepper to taste. 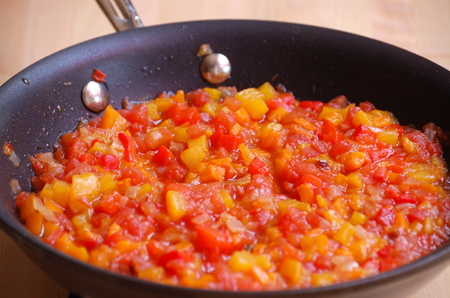 To serve, heat the broiler and place skillet under it until lightly browned. Slice in quarters and lift very carefully onto plate with an offset spatula. Turn spatula 90 degrees as you set the food down, gently fanning the food into fan shape. Drizzle the vinaigrette around plate. Use the crema balsamica to decorate the rim. 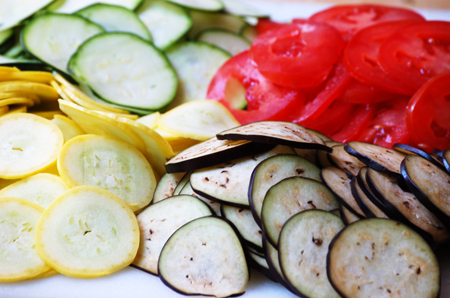 Serves 4 as a light entrée, and 6 as a side dish. What a beautiful ratatuille, David. I feel like it's summer already! I love the way you plated it up! I hope you finally do get a reservation at that restaurant. Thanks, Kirsten! Now that you mention it, I want to know why Brangelina didn't invite me to sit with them at THEIR table!!?? Not sure I will ever get a reservation but I will continue to try! My first encounter with Mr Keller (albeit, only through visiting his bakery in NYC, Bouchon)was one to remember. I bought a few desserts. The one that stood out were the Macarons. They are etched in my memory. Beautiful photography. Look forward to more posts from this book. Wow that is just such a beautiful dish! The colours in your photos have made me so happy. I hope you get the reservation! Karin! Thanks for the compliments and, even if Keller is a bit full of himself, I still want to eat there! And Mr. K can get a reservation here anytime! Anna - I may never get that reservation but it is definitely on my bucket list!! As always, such a wonderful and inspiring piece and, at the same time, you make me feel like I can put together a Thomas Keller meal! Your photographs are works of art! I just had a conversation with Win Rhoades who, as you know but for the sake of your readers, is the proprietor of South Street and Vine in Portsmouth, NH. First, he has been to the French Laundry! Every bit as wonderful as it is said to be, he reports. Second, Win also alerted me to Sunday's NYT piece in which Mark Bittman invites Thomas Keller to make sense (for us average folk)of famed French chef Fernand Point's recipes. We said that he should enlist you to do so! Thanks for another great piece and, of course, the opportunity to post with you! Susan, that is good to know, and I am glad Win got in! I did read the NY Times article and looked at the recipes, too. The photos and the recipes didn't seem to align, though... like there were many more fancy steps that were omitted... I want it ALL!